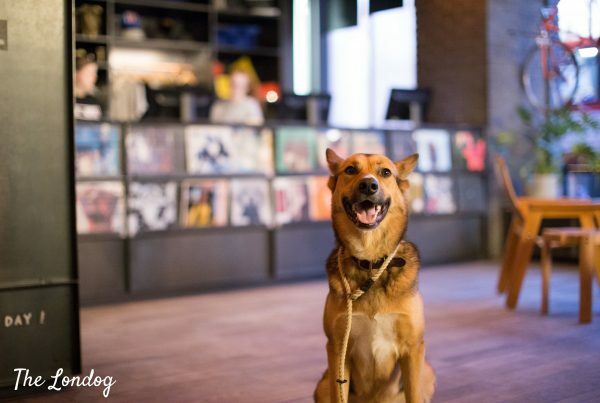 If you are looking for a dog day out in East London, with views of the river, sunny spots and a very different taste from the rest of town, a destination for you is Trinity Buoy Wharf, on the North bank opposite the O2 Arena. 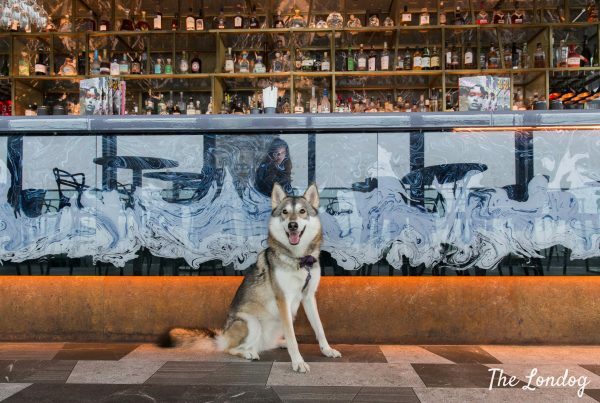 What is defined as Docklands’ most exciting arts quarter, happens to be a very dog-friendly place too. We visited for a relaxing stroll and lunch and today we tell you about it. Enclosed by the Thames, Bow Creek and some busy roads, Trinity Buoy Wharf is located in an area that is undergoing a massive restyling and will definitely look very different in a few years time, with new luxury buildings on their way nearby. 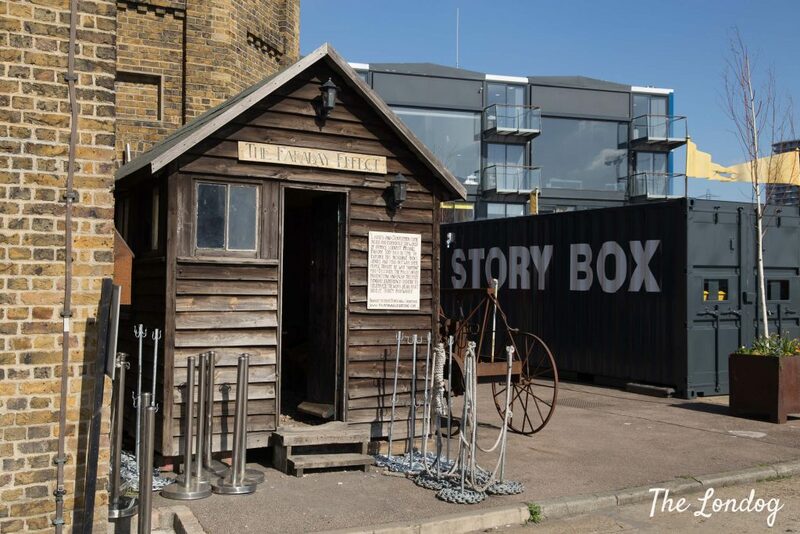 As a fresh, creative and colourful quarter, one must hope that all the changes in the area will not undermine Trinity Buoy Wharf’s characte, which was mainly conceived to provide affordable creative spaces and studios for artists. 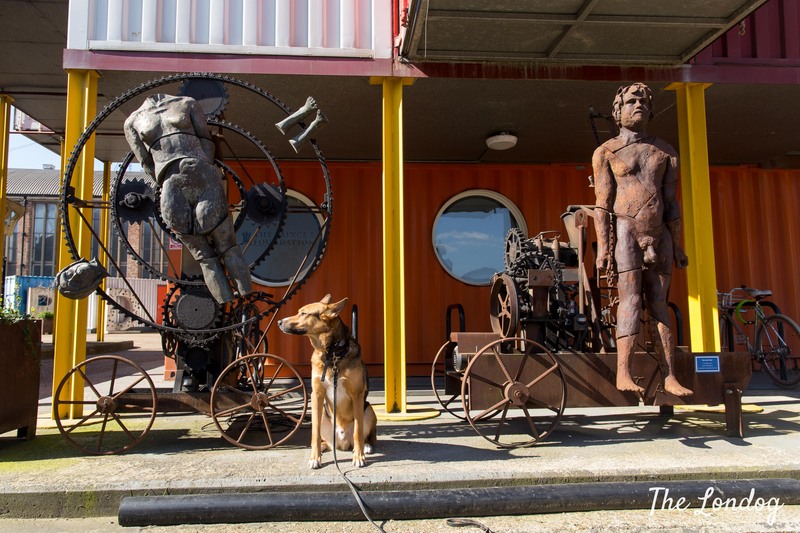 Walking to Trinity Buoy Wharf from Orchard Place, you will find old buildings, a big ironwork and will immediately recognise the place from the gates and some original sculptures at the end of Orchard Place, with a bit of a surprise factor. Right at the entrance you will find a dog-friendly cafe (more about this later) and a red ship. Unfortunately the latter is not open to the public, but we investigated and you would never guess what it hosts… a music recording studio called Soup Studio (on their website there are also some tracks from their recordings which I very much recommend you check out to discover some new music)! If you are curious, you can also find out more about its story here. 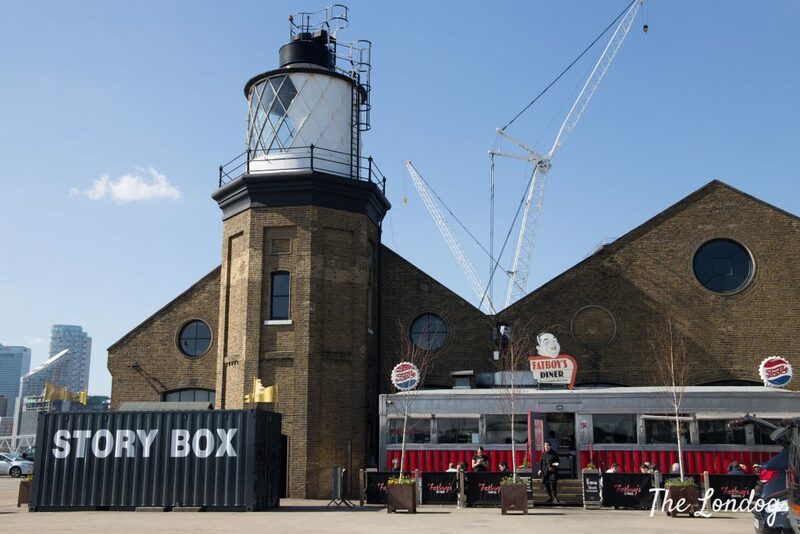 Trinity Buoy Wharf development hosts workspaces, the American style Fat Boy’s Diner (where dogs are allowed at the outside tables but not inside), the dog-friendly Orchard Cafe, sculptures, the Faraday Effect, a Lighthouse with a permanent installation and more. One thing that doesn’t lack at Trinity Buoy Wharf is colour. In fact, chromatic variations of red, yellow and blue give containers a great look, while sculptures and features surprise you behind the corners. It is an unexpected place, which doesn’t feel like London and is at first difficult to frame. 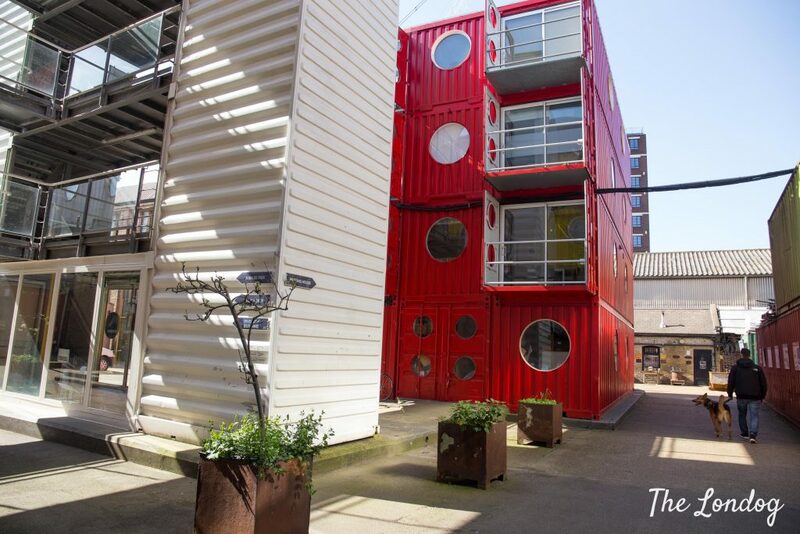 Its so-called Container City, is made of modular flexible system using reduntant shipping containers and hosts dog-friendly workspaces and studios. The is also the Sculpture Park, a permanent open-air collection by sculptor Andrew Baldwin (you can see some of them in the cover photo). If you are intrigued by this peculiar place, a documentary was released in occasion of the 20th anniversary of Trinity Buoy Wharf. 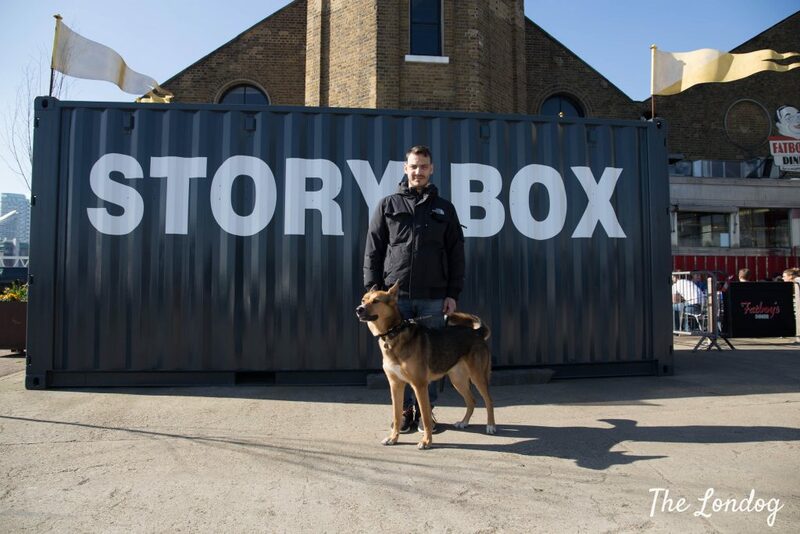 But there is more dog-friendly to explore at Trinity Buoy Wharf than a stroll among containers and sculptures. 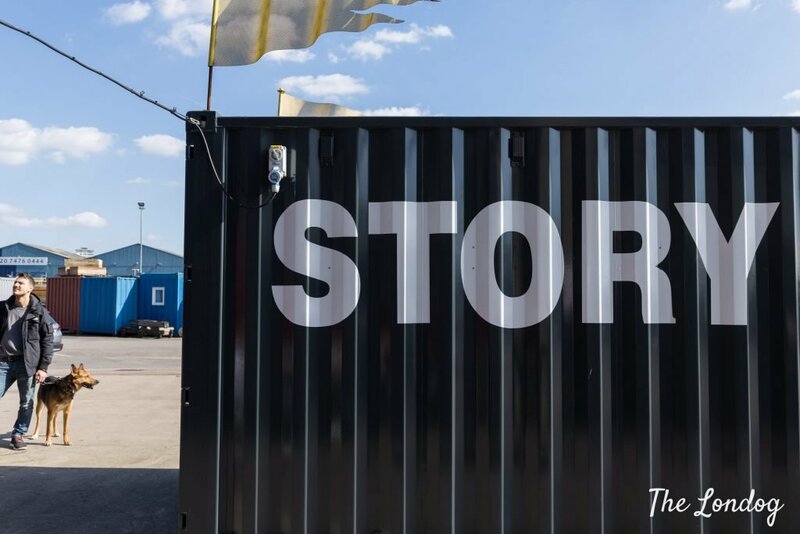 Walking around Trinity Buoy Wharf we found the Faraday Effect, a permanent installation about scientist Michael Faraday and his studies about electromagnetism created by Fourth Wall Creations as a sensory experience to celebrate his work. 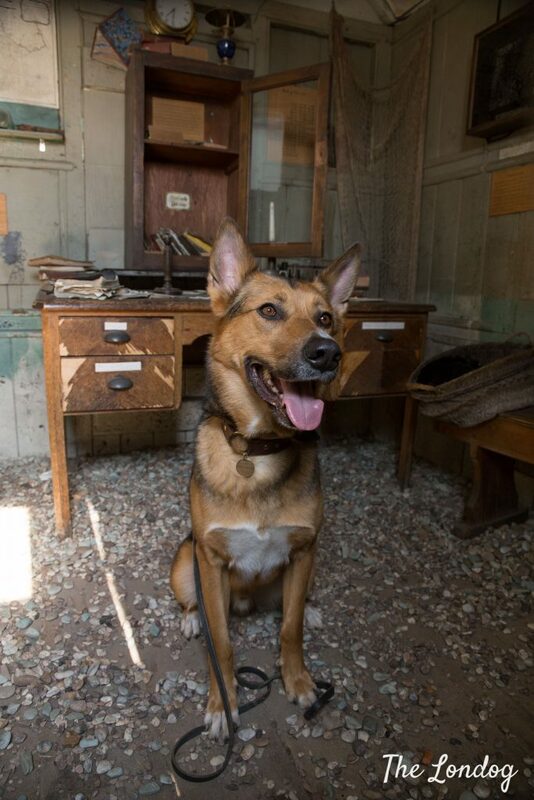 It recreates his office in a shed, with papers, tools and even a stuffed cat in a basket. While on the internet it is sometimes referred to as the tiniest museum, this is is fact and installation not to be confused with the Faraday Museum (which is located at the Royal Institution in Mayfair and preserves the real Faraday’s laboratory). It is so small that entering in two people already fills its space and we woulnd’t fit comfortably with Argo, so we took turns. A fun one to see, although Argo preferred they outdoor space to its narrow space. Right next to the Faraday Effect there is an old lighthouse. This has been re-purposed as home for the Longplayer, a musical composition which started playing in 1999 and is set to play without repetition or interruption until 2999 (crazy, ah?). 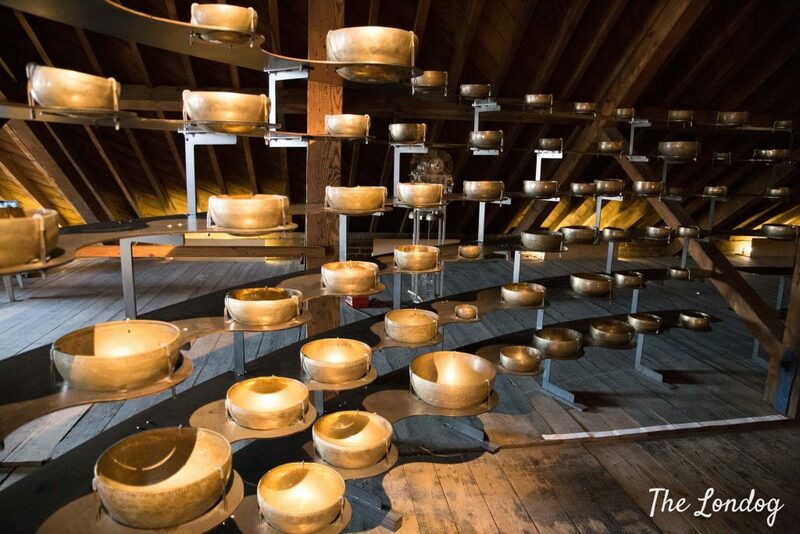 While the composition is played by a computer, combining six ever changing musical patterns, at the lighthouse you can see the original singing bowls which served to create the various sets of sounds used for the composition. 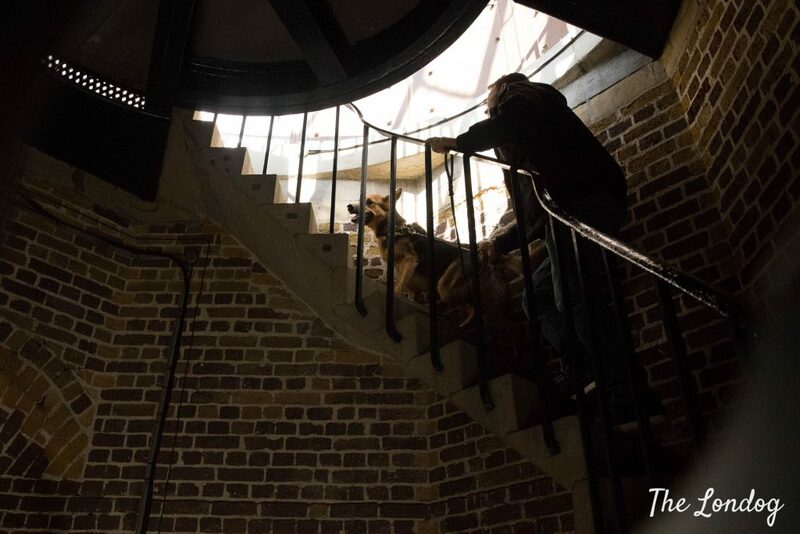 The best place to hear it at the lighthouse is apparently the Lantern Room upstairs and, since dogs are allowed, we climbed up for for a visit. If you visit, just mind the steps which are steep and narrow. While we personally didn’t find the musical experience particularly striking -for how impressive it is something playing for 1,000 years without repetition -, the part that we most enjoyed was the Lantern Room itself. 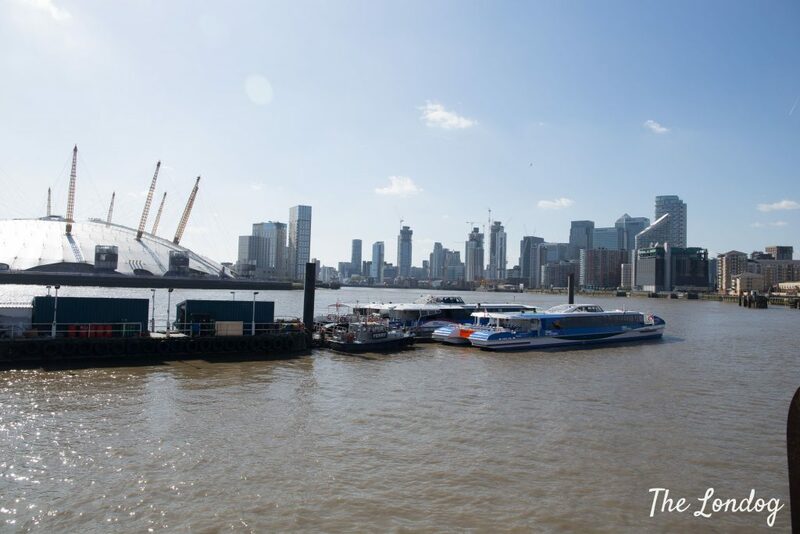 From there you can enjoy an amazing view of the Thames, the O2, Canary Wharf and more, which is a real treat! So you know when you can visit, the Longplayer is open every Saturday and Sunday (April to September 11am to 5pm, and October to March – 11 am to 4 pm). The Fat Boy’s Diner, is a 50s-style chrome diner, where you could imagine a see a scene from some classic American movie taking place. Burgers, hot dogs, chips and milkshakes are on the menu, with immancable ketchup waiting on the table. We checked with the staff and they told us that dogs are only allowed in the outdoor seating area, so we sat at the only available table. Next to ours, there was already a little terrier with his humans. We had a burger and mozzarella sticks and asked the waitress for a water bowl for Argo, which came in the form of an upcycled burger box. The weather was lovely and warm in the sun. If you visit and you are craving some Spring sunrays just be mindful of the Earth’s rotation: as we started eating the sun moved behind the building and we found ourselves in the shade, which was a bit chilly. However, this can be a great advantage in Summer, when on the contrary you wish to give your furry friend some shade on a scorching day. 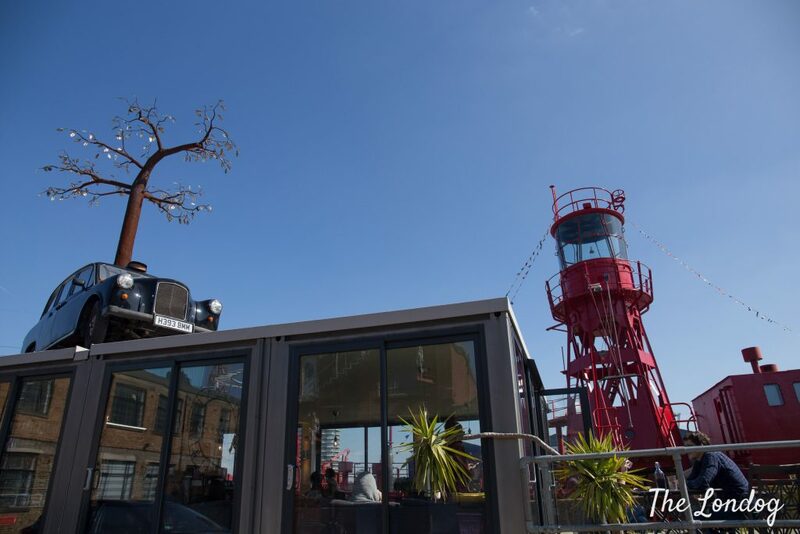 Alternatively, you can have a drink or a bite at the Orchard Cafe, located near the entrance of Trinity Buoy Wharf. This cafe is dog-friendly both on the terrace and inside and is right next to where the Trinity House red ship is moored. It is a nice and relatively cheap place for coffee, tea, hot chocolate and they also serve food and snacks food (in the form of cakes, salads, sandwiches, eggs and more – they are currently changing menu for the new season, but no menu is available online). We visited on a sunny day and it was absolutely lovely. You probably want to allow a couple of hours or so for you visit. The area is not that big, but between the visits to the various dog-friendly attractions and lunch, time will fly quickly. 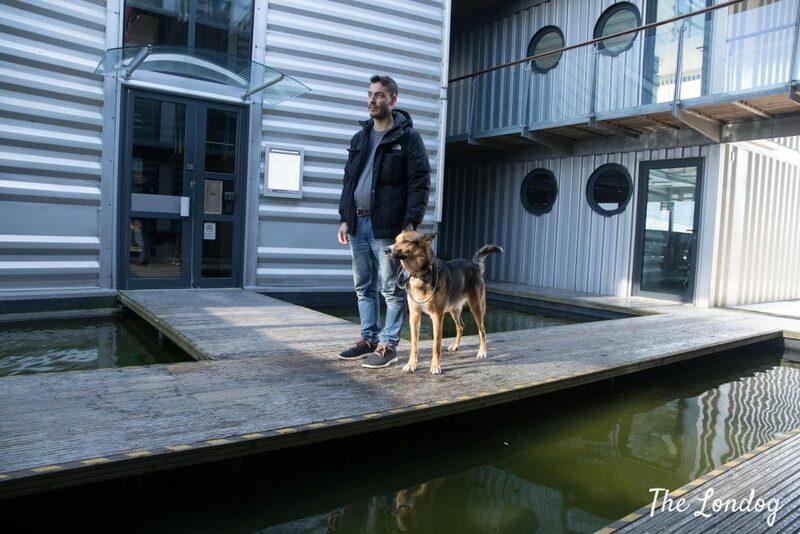 You can combine your visit with a walk to East India Dock Basin, where there is also a green area where you can give your dog a run and continue on the Thames Path for a walk towards Canary Wharf. You could event continue down to reach Island Gardens at the bottom of Isle of Dogs, which is 2.5 miles (4.5km) point to point, probably an hour walk (map here). If you don’t drive, to reach Trinity Buoy Wharf you have some public transport alternatives. You can either take the Jubilee line or the DLR getting off at Canning Town and walking from there (you also can get off at East India with the DLR). You can alternatively take the D3 bus (which route includes stops in the Canary Wharf, Limehouse, Wapping, Bethnal Green areas) or the 277 bus. While Trinity Buoy Wharf, at Clipper House, is also home to the MBNA Thames Clipper HQ, surprisingly there is no direct ferry stop at Trinity Buoy Wharf. 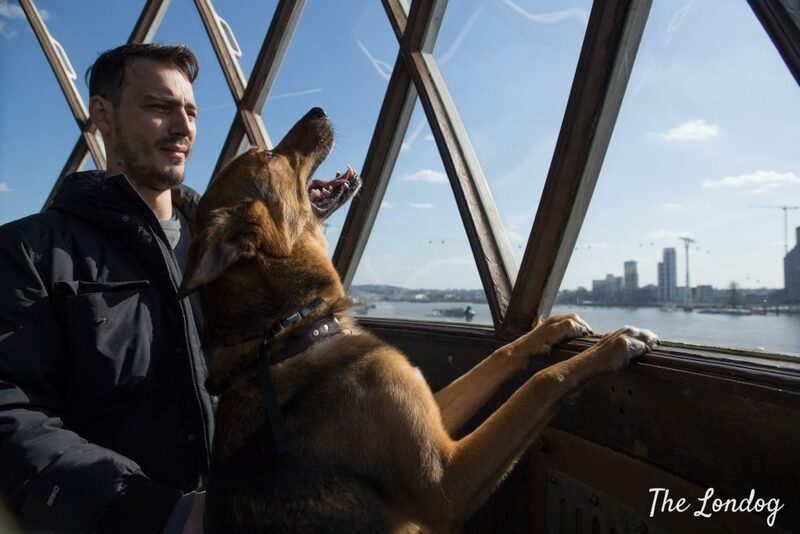 Instead, you can take a designated boat service (a boat called Predator), which runs from the O2 QEII Pier to Trinity Buoy Wharf Jubilee Pier, which costs £2 each way (you have to call them on 07947 637 925 upon arrival) and from North Greenwich then change with the Thames Clipper with your dog to sail back to Central London (separate fare). Unfortunately, the special boat service only operates Monday to Friday from 5am – 7pm, which leaves you without a river choice over the weekend, unless you swim to North Greenwich (please don’t try it). Looking for inspiration for other dog days out? For more ideas click the button below.